"LITTLE and BIG BUBBA! STEAM"
Now for us to finish! 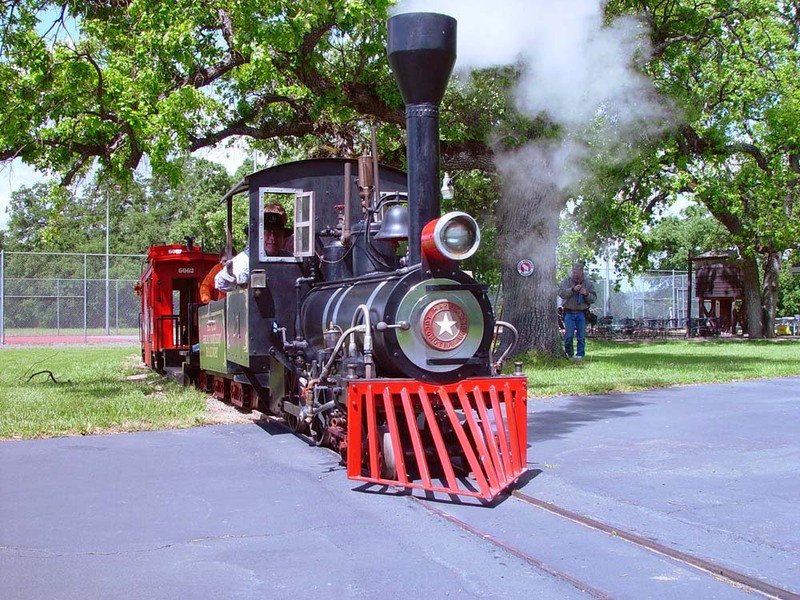 Our layout also features a 14' high functioning water tower, 50' train station, 65' tunnel, and a new Railroad Bridge, including a 68.5 foot long free span Warren Truss all steel section. David Moeller (engineer, neighbor) and I built it ... Melvin Harris gave us the indea of steel instead of wood and drew a sketch of one on his kitchen table ... Dave & I took it from there. 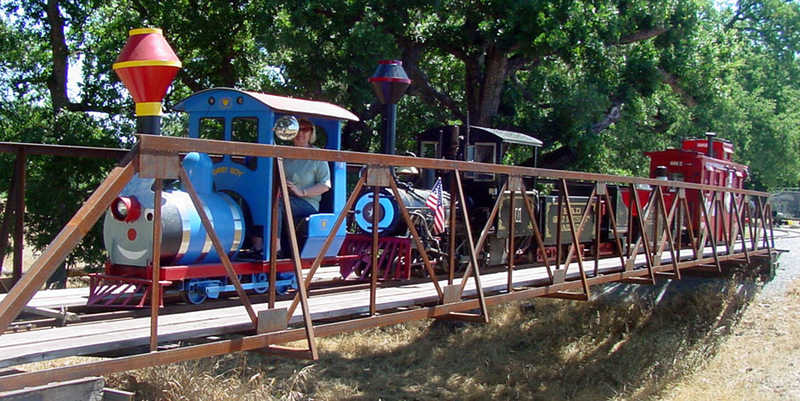 I welded it all ... Becky says we should call the new railroad bridge (B&B) .... Brains and Brawn! .... Meet Brawny Hemp!... 09 I added a center support ... Not needed from an engineering standpoint, but just one more safety feature. 5/19/07 .... finished another switch ... a #8 size this time and finished tying our #2 loop back into our main #3 loop. 8/6/06 ...... We placed our gold splice bar and bolts today finishing our 4 year phase 3 project by tying our new phase 3 loop into our main line!!!!!! I still have about 130' of deep fill and 1" crushed granite to place under the last section of track .. But it is now connected! ...Finishing our phase #3 loop out over the bridge and back across our land fill bridge and into our tunnel. 8/12/06 ... Dave & I finished with all the road bed this morning ... Dave & I worked till noon yesterday and then I went out again from 5 - 10 pm ... worked in the dark with my head mounted LED spot light. Dave, Becky & I took our Maiden Voyage this morning ... It is wonderful!!! Smooth and it takes about 6 minutes non stop and that is loop 3 without any repeat track. We will usually stop with our passengers on our bridge, at our view point if Mt. Shasta is visible, and at 3 road crossings making the loop about 10 minutes long. We then still have loop one and loop 2 we can switch onto if we wish. Prolly won't do that unless we have 2 or more engines running at once. 7/22/2006 .... We now have almost 3/4 mile of total track laid. 6/17/06 ... I started at 6 am and reinforced an old curve, Dave Moeller came by shortly after and we worked straight thru till 2:30 pm ... 100 degrees in the shade but a nice breeze and no humidity ... We poured the concrete for and placed our full sized switch stand. We also finished restoring our work flat car. (The beginning of our Phase #3 track here also) It is the same car Melvin loaned us 8 years ago to use with his little speeder when we put in all the ballast during phase #1 ...See photos there. 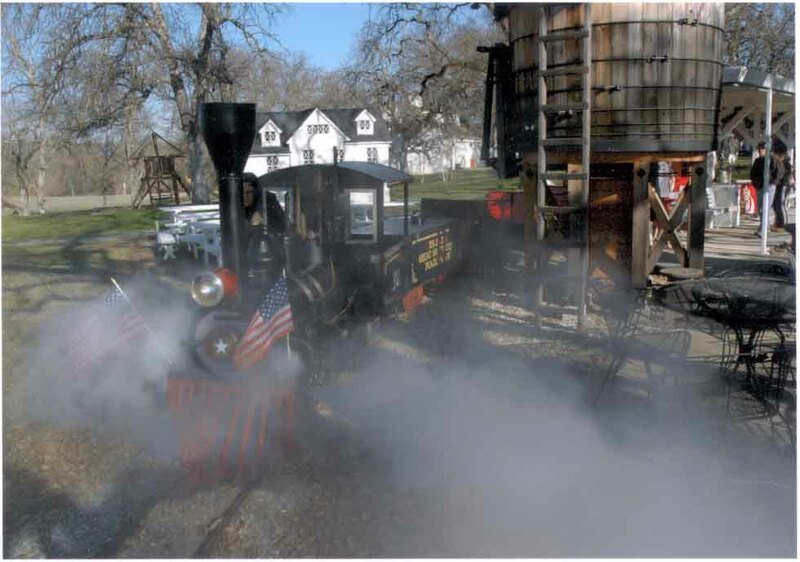 I bought it from him and we replaced all the bearings and all the wood with wood cut at Melvin's steam powered saw mill. We can now use this to move rail and the welder on across the bridge along with all our tools. A note .... After building this switch, and granted it may be one of the only ones ever built directly into an existing straight and an existing curve and probably much harder than building one seperately that can replace any straight section. But, Dave & have only the greatest respect for anyone that builds these things! I used to think Hillcrest and Harmer Steel and others charged way to much. Not so! ... these things really take a lot of engineering, planning, time and the utmost care and patience! .... If we had to build these for someone else we'd charge a LOT MORE than they do! Before starting these movies ... stop the music at the top of this page first and turn you volume way up to hear the great steel on steel sound. I had only 15 seconds for this 5th movie and a lot of track to cover to show some of the latest track on the far side of the bridge ... I am really flying here and still couldn't get it all in .... the last section is passable but has only the wood and steel ties and no road bed yet. ... More to follow. Do have some stills I will put up on the phase #3 and flat car page. And on the still photo just below this we are now as of 7/13/06 all the way around to the telephone pole in the background. Update 7/16/06 ... We are now up to the far left side of the photo below. Switch almost finished ... Derailer guards placed and almost ready to add splice bars and weld into place. This is also where we will be building 2 more switches for our Y to turn our train around and run in the opposite direction. Before this though we have to build the one on the other side of our new tunnel back into our main line. NONE of this could ever have happened! ZERO Deflection in the 3" crown we built into this all Steel Warren Truss Bridge. An electric, steam double header. With our long flat car attached we would have about an 80' train now. 5/17/06 - Dave Moeller and I have already started in designing and building our own multiple custom in place switches. We are building them into our existing curves and straights utilizing the already in place curved track without needing to pre build or bend hardly any additional track. We will be getting our load of new track, spilce bars and 3 new full sized and reconditioned switch stands any day now! 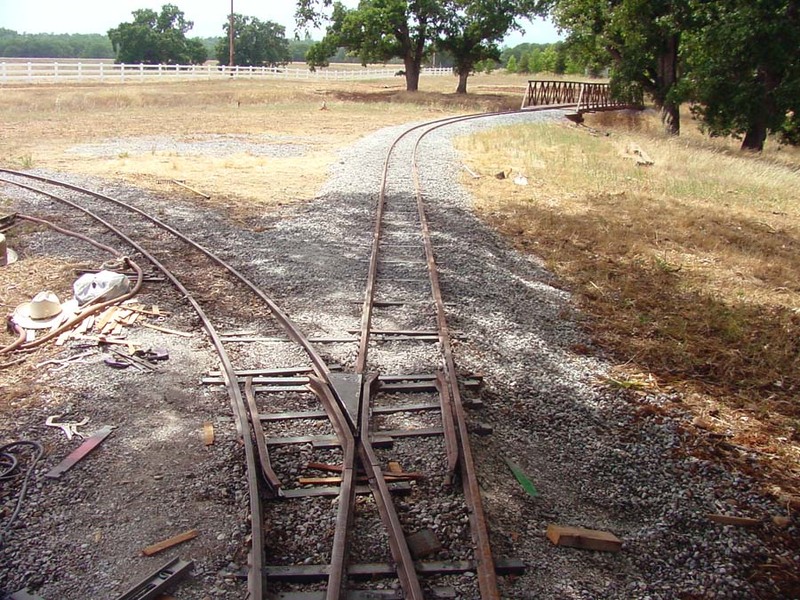 The huge loop of additional track will be going over the new Warren Truss bridge Dave & Built last summer and loop back across the land bridge on the other side .....I am also adding another switch, rail and stall to the train barn. ...... By the end of this summer we should have 3 main large loops we can take. 2/12/06 Udate .. Finally another perfect day today ... 80 degrees, Went to Gerlinger Steel and picked up 2 junk pieces of 10" wide X 1/8" Thick by 50" long flat bar .... Designed and built a whole new bracket and support system for the tables in our passenger cars. Welded the base plate of the table to the flat bar and cut 2" Channel to finish off the sides .... 6 screws hold the whole thing in solid as a rock now! 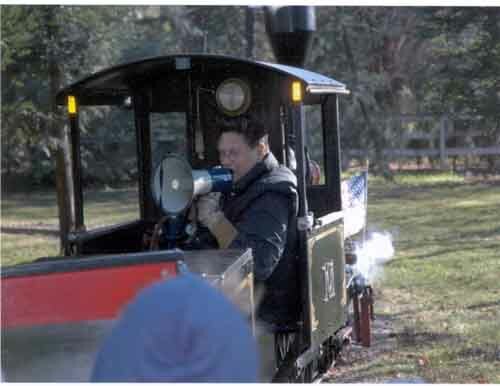 To visit our other train pages. 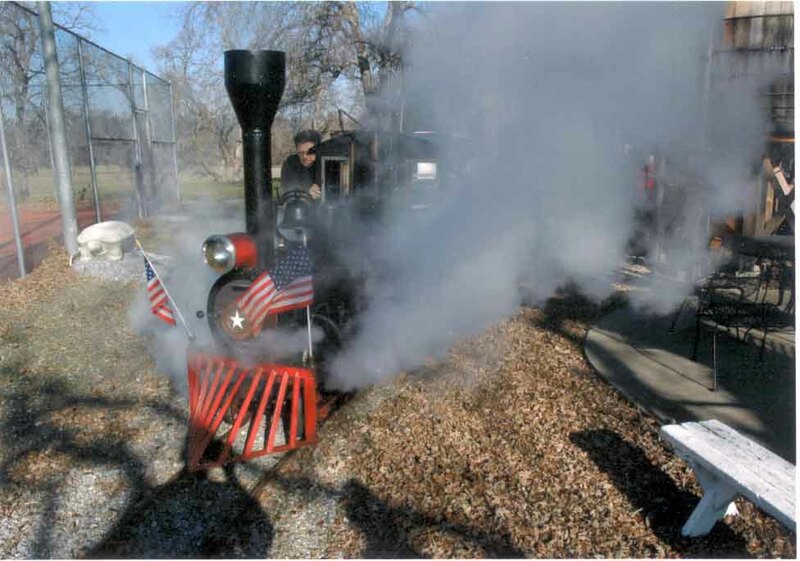 At our Home riding in our steam and electric trains. 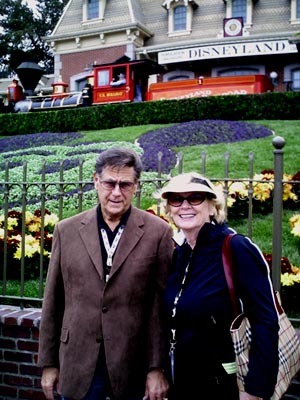 "Uncle Joe", Cecil & Joanna Ride with us on our dinner train. 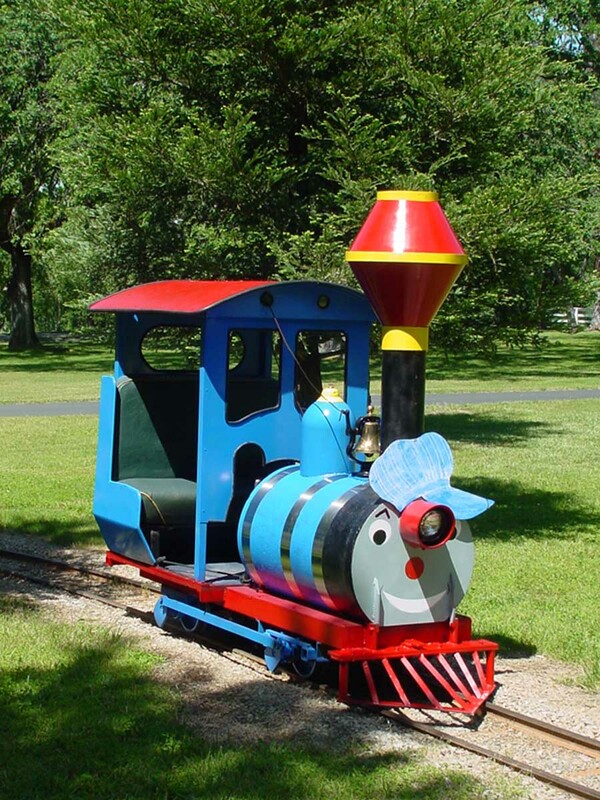 See Our Newest Electric Switcher Engine! "DAVEY BOY"
See how Dave Moeller and I are building this difficult and seldom used type switch into and existing curve. See Our Bridge moved into place with a 100 Ton Crane 11/19/05! Visit our 5/04 Second Phase Track & Tunnel Development! See Photos of B.A.D. Great Northern Railroad by Matt Starman. Steps To Steaming up "Little Bubba"
Russ and Suzy are good friends of ours .. I do his web site for him ... I took most of the photos 11/05. RETURN TO OUR NEW B.A.D. 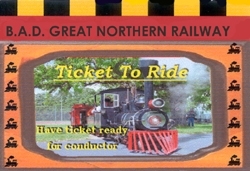 GREAT NORTHERN RAILWAY SITE! July 25-31, 2009 - World Wide Country Tours .. Hundreds of GREAT PHOTOS! Pikes Peak Railway, Royal Gorge Railroad, Cumbres/Toltec in New Mexico, Durango/Silverton, and Leadville. From Orville, CA to Portola, CA via the beautiful Feather River Canyon. My favorite railroad place in the world! A must trip to take with us day by day! Over 200 hours into this site .. many many photos. Pacific Norhtwest to Canada & Back. 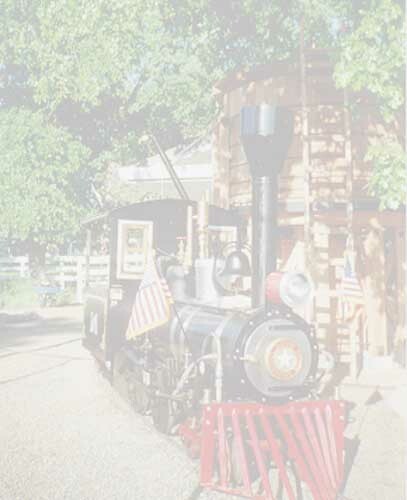 See the Izaac Walton Railroad Inn. Grand Canyon Train Trip in Sept 04! Grand Canyon Train trip from Williams Arizona to Grand Canyon and back. Lots of exclusive flood photos from the train! NEW! ...Visit Monument Valley with us too! Still part of our Sept 04 Trip. Our August 2005 R.V. and Train Vacation!!! Finally Done now that the rains are here ... 7 pages with hundreds of photos. 3rd largest operating Steam locomotive in the world! Visit Grand Scale Quaterly's 2003 Convention! See the Grand Scales Quarterly Article B.A.D. G.N.R. ... When we first started. We have a little bit of G Scale stuff we run at Xmas and out back on the deck for the kids to run and we have some of it displayed in our dental office as well. 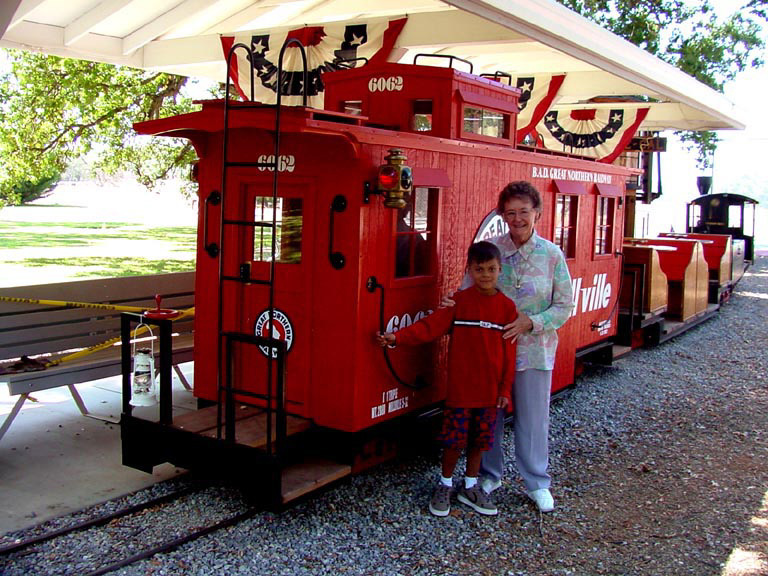 We love trains of all sizes and Scale and otherwise. 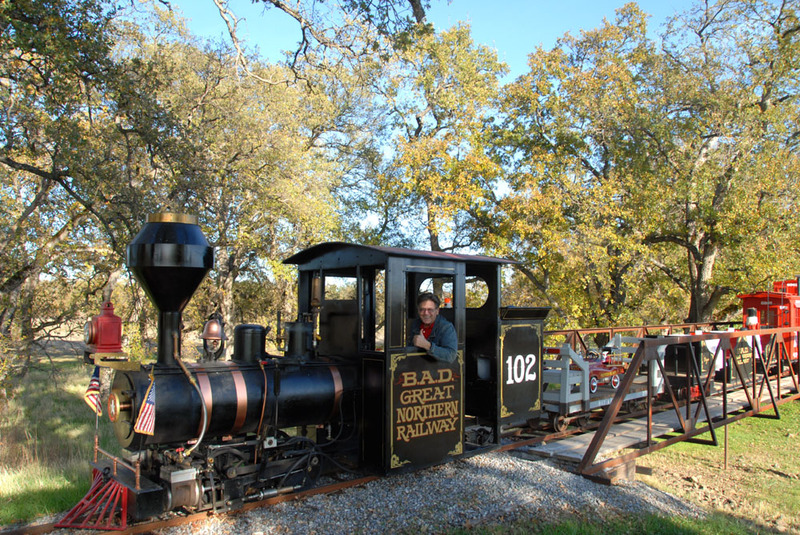 This is by far the best Grand Scale Railroad in the USA! This is a Brand New Magazine .. a must to see! By John Sayer of the Arizona & Pacifice Railroad. Send Email To Dave & Becky Hemp. 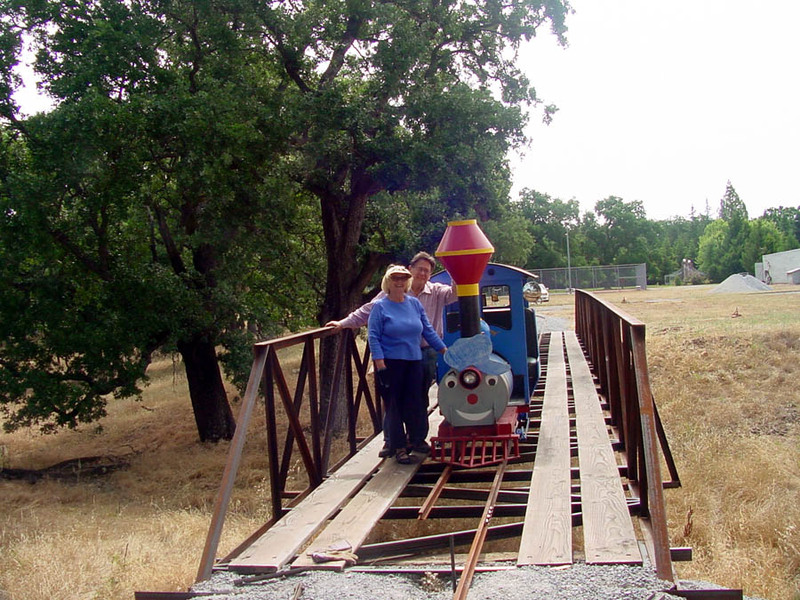 Click on our cool links animation below for the other train links we used to have here. Ran out of room here. Riding Railkits - Start Your Back Yard Hobby Here! 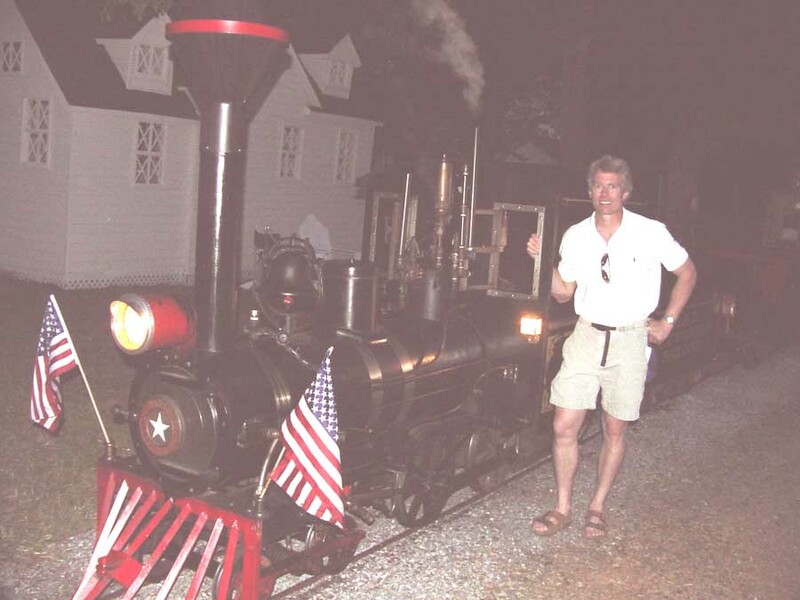 .. Rod Johnston is another dentist that loves trains. He is the John Johnston of the comic strip "For Better or Worse". 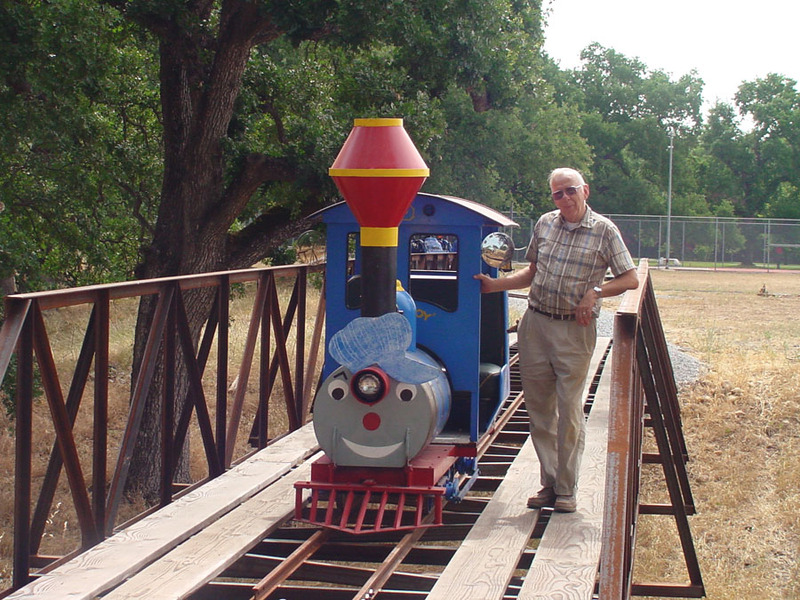 His specialty is the smaller ride aboard and most affordable scale home railroad that can be used on small or large plots of land as recently featured on the show "Tracks Ahead". Please visit his Riding Railkits website and tell em Doc Hemp Sentcha! Since 01/01/06 ... But ... It fails and resets to 0 a lot. We have millions of total visits per year to our many site pages as per search engine info.